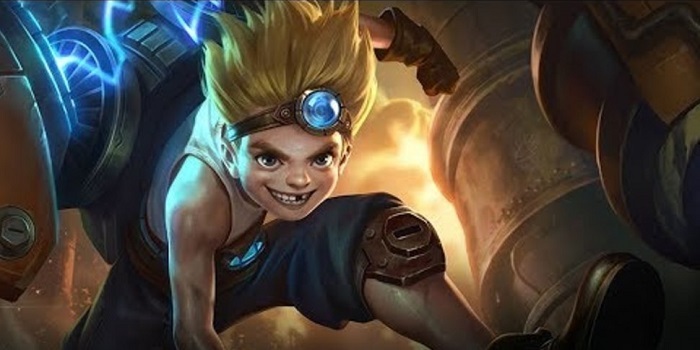 A guide to Arena of Valor's Max, the Wunderkind. Max uses his mighty mechanical apparatus to push through fights and batter foes with continuous true damage. He can climb aboard the machine and fly into battle, starting things off with a bang. Max is a tank/warrior who specializes at roaming around the battlefield. His basic abilities allow him to move around fights and control his enemies’ movement. His ultimate grants his team vision of all enemies on the battle field. After its initial cast, Max can use the ability again to soar across the arena and collide with a single enemy. Moderate Control – Both Smooth Moves and Liftoff provide ways to stun and stop opponents. If not able to knock them out with his damage, Max should have an easy time suppressing enemies while his teammates clean them up. High Damage – Max’s abilities offer the Wunderkind quite a bit of damage. Both Bionic Blender and Liftoff have high base damage and great damage scaling, allowing Max to knock large chunks of health off of opponents. In addition, periodically damaging enemies will cause his passive to continually chip away at their health with true damage. Global Ultimate – Max’s signature move is his ultimate ability: an amazing asset to any team he is a part of. The first effect alone can be a huge help, revealing all heroes currently on the map. Casting it again causes Max to fly across the map and crash into a hero, he gaining a number of strong bonuses as he does so. Short Range without Ultimate – Outside of his global ultimate, Max’s abilities are rather short range. Marksmen or mages who can keep their distance or shut down his ultimate won’t be in much danger when fighting against him. Similarly, Max has a difficult time escaping from opponents, so be certain of the odds before jumping in. Low Solo Potential – Max is like Ormarr in that he is stronger when supporting allies than when trying to fight alone. His long-range ultimate will need careful coordination with the team as to avoid sending the boy genius into a deathtrap. You want to roam around the map as much as possible to support the lanes. Coordinate with the team and tell them where you are heading and when you plan to gank the lanes. Clear waves with Bionic Blender. The damage it provides will let you knock out minions very quickly so that you can move to ganking. Use your ultimate whenever large amounts of enemies are missing. Even if you don’t end up using the rocket jump, being able to see everyone on the map is a huge advantage to the team. Start by leveling Bionic Blender, continuing to prioritize it throughout the game. The extra 60 damage per level adds up because the cooldown is only five seconds. Max’s ultimate is extremely powerful and should be leveled whenever possible. The improvements gained each rank are small, but they outclass the small gains of his other abilities. Solo Fights: You should generally initiate with your ultimate. While using it to finish foes will make Max near inescapable, the bonuses his ultimate provides are too good to waste on chasing. Use Bionic Blender right after engaging to up your movement speed and continue to blast away their health. Hold the enemy in place and stick close to them by hopping over them with Smooth Moves as you continue your barrage. Team Fights: You want to be initiating team fights along with the tanks. Your ultimate is the premier tool for this, as the initial flares will allow players to see if a trap is waiting for them. Charge into a squishy enemy with your rocket and pummel them with Bionic Blender. Keep them from moving or escaping with Smooth Moves and continue your assault. Side note: if your team lacks coordination, it might be worth it to wait for your other tank to initiate before diving the back line; running in and expecting your team to follow could result in disaster. Escaping Fights: Max is rather limited in ways to escape, but not helpless. If you still have your ultimate and an enemy is away from those chasing you, Liftoff towards them, cancelling the ability after getting some distance from the enemy. This requires a lot of time, however, as Liftoff has a long animation and takes time to reach full speed. Alternatively, Smooth Moves can be used to hop over minions or monsters to get away from the fight. This can additionally be used over walls for added effect, or you can juke your opponent one way and head the other when their abilities are on cooldown. Finally, if there are minions or opposing heroes around, try to hit as many as possible to up your movement speed by a maximum of 50%. Bonus: Max is excellent at picking off split-pushing heroes. Use Liftoff to spot them and track them down, then stick to them with Bionic Blender and Smooth Moves (this is easier with Frost Cape) to punish them for their insolence. Static Shock – Passive – Every time Max damages an enemy, the enemy gets shocked, causing them to suffer 30 (+4 per level) (+0.18 AD) true damage per second and have their health regeneration reduced by 25% for 3 seconds. This ability is not triggered by items’ damaging effects like Mail of Pain or Mantle of Ra. Stacks in duration (timer resets every time Max applies damage), but not in effect. Bionic Blender– Max spins his robot arms around, dealing 300/360/420/480/540/600 (+0.9 AD) physical damage to enemies. Every time he hits an enemy, he increases his movement speed by 10% (up to a maximum of 30%) for 4 seconds. Max moves forward 150 units while attacking. He is able to walk through heroes and minions, but not walls. Bionic Blender is Max’s main damaging ability outside of his ultimate. Connecting with multiple minions or heroes applies his passive to all them, effectively acting like Mganga‘s poison. Smooth Moves – Max rushes towards his target and flips over them, landing on their opposite side. Once on the other side, Max activates a magnetic force field that reduces Max’s damage taken by 15/16/17/18/19/20% for 3 seconds. This ability can be used again within 4 seconds. Smooth Moves stuns the target for 0.5 seconds on hit. Max can be stunned while using this ability, but not moved. If stunned, he will stop moving and remain whereever he was at time of stunning. Use this to jump over heroes as they cast skill shots in order to dodge them. As an example, Thane’s ultimate can be easily dodged if targeted just as he starts to cast it. Liftoff – Max fires trackers that attach to all enemy heroes for a short time. The trackers allow allies to see the enemies’ locations and interrupt enemy recall actions. While the trackers are active, Max can then select an enemy to track and ram into by holding down the ability button. Ramming into the enemy deals 700/950/1200 (+2.0 AD) physical damage and knocks them back. If Max takes too long to select an enemy, then he will have to fire the trackers again. When Max lands, he activates a magnetic force field that reduces his damage taken, increases his resistance by 30%, and shocks all nearby enemies. Pressing the ability again while Max is tracking an enemy will cancel the attack, making Max land immediately and activate his force field. Max can be attacked and damaged while travelling. The damage reduction lasts for 4 seconds, the shocking aura lasts for 10 seconds, and the resistance lasts for 10 seconds. If you’re on the opposing team, an indicator will appear above your hero when you’re visible, and you or your ally will blink red on the minimap when targeted. Stay out of his range, especially when he is buffed up after using his ultimate. His abilities are rather short range and therefore easily avoided by ranged attackers. Heroes who stack their HP can counter Max’s true damage-dealing passive. As Max will be spending most of his time using abilities in battle, purchasing Fafnir’s Talon is not a wise choice to counter this particular counter. This build aims to balance defense and offense to make Max into a capable bruiser. Mantle of Ra stacks with his passive, causing nearby enemies to constantly lose health. Defensive choices of The Aegis and Medallion of Troy keep the Wunderkind up while in the middle of fights while hastening the rate at which he can use his abilities as well. Frost Cape will help the brawler stick to his opponents, and Fenrir’s Tooth will help Max finish them off. Fun fact: the passive of Fenrir’s Tooth will apply to the pulsating damage of Static Shock if the enemy is brought below 50% while it’s active. Max can benefit from either offensive or defensive arcana. If going offensive, taking ten of each Onslaught, Assassinate, and Skewer is a safe bet to make sure that his attacks punch through enemy defenses. Conversely, if wanting to harden Max’s skin, sets of Indomitable, Benevolence, and Valiance keep him up and going during the earlier stages of the game. The true damage from Max’s passive will do a lot in softening tanks up. Keep up a constant stream of harassment when next to a tank, ensuring that they remain shocked as long as possible. Generally, these are not high priority targets. Warriors can be a problem for Max when they have more experience or gold than he. Additionally, they aren’t generally targets you want to focus on, so avoid taking them on alone. Hold them down with your control abilities and chip away their health with Shock when dealing with them in team fights. Use Smooth Moves to interrupt an assassin’s combo and gain some damage reduction. Bionic Blender can additionally help you escape from them through its speed boost as they try to burst you down. Once their combo is used up, hold them down with Smooth Moves and whittle away their health with Bionic Blender and Shock. Usually, your sustained damage will outmatch theirs if they don’t have their burst available. Be sure to grab some magic defense if the enemy mages are getting scary. Get as close as you can with Smooth Moves. Max can have trouble getting close to ranged foes without his ultimate, so the sooner you can close the gap the better. Marksmen will be easy pickings if you can get close. Stick to them with Smooth Moves and Bionic Blender’s speed boost. Marksmen are your number one priority and the easiest to pick off in ganks. Supports can be a big problem for Max. While he can generally shrug off control effect with his ultimate, he can still be stopped by a constant barrage of the spells. Being unable to approach his targets leaves him helpless to ranged fire and thereby a sitting duck in teach engagements. Pick off supports when they are alone, but try to avoid them in team fights.